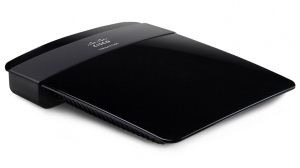 Linksys has become synonymous for routers, and for very good reason. I’ve owned many Linksys items, and I’ve always been pleased with their quality. I’m able to say the same for this one and it’s even better than I expected. I was looking to upgrade from my previous router, and I chose this one. I’m glad I decided to purchase it. because it may depend entirely on the type of microwave that you have. The signal strength for the E1200 is amazing! I love it because I’m consistently getting 5/5 bars for signal throughout my house and even in areas on the outside. With my previous router I would be happy to get about 2-3 bars of signal, which is why I believe the E1200 is so impressive. it also gives you the ability to restrict the internet time to certain times, for certain users. This may seem like a small caveat but I was really intrigued by this because the internet has unlimited data, and I believe it’s important to have some restrictions for kids. Overall, I believe it’s terrific! I paid 44 dollars for it, which probably shouldn’t be considered cheap, but I feel like I received what I paid for. If you’re in the market for a wireless router, or if you’re looking to upgrade, I would highly recommend the Linksys E1200!